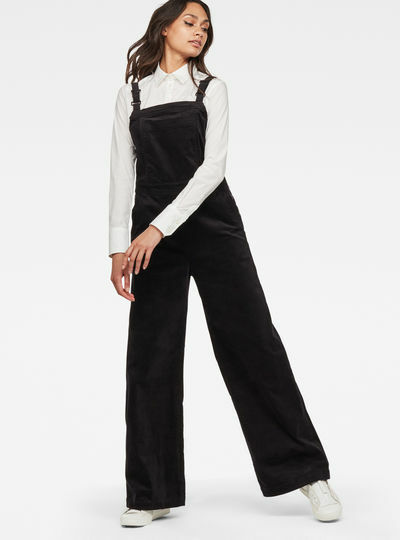 Women’s jumpsuits and overalls are back in the fashion world. And we understand why. They give you a sturdy or even elegant but always easy going look. At G-Star RAW you’ll find jumpsuits for women in different styles. From the sturdy denim women’s overall for a casual style to a classy shiny jumpsuits for women to match your look on romantic evenings. The options in combinations for jumpsuits and overalls for women are endless. For example match your overall with a nice basic shirt and sweater. You can wear it with a nice pair of sneakers sneakers for a sporty and comfortable look or with high heels for an elegant look. And don’t forget to match your jumpsuit with the right accessories for the finishing touch. One thing all jumpsuits and overalls have in common; they are so comfortable. Perfect for laid-back evenings but also for a dinner party. It’s all in the styling. Order women’s jumpsuits easily online!